CNI is the top-ranked railway name per my factor-based stock quality model. 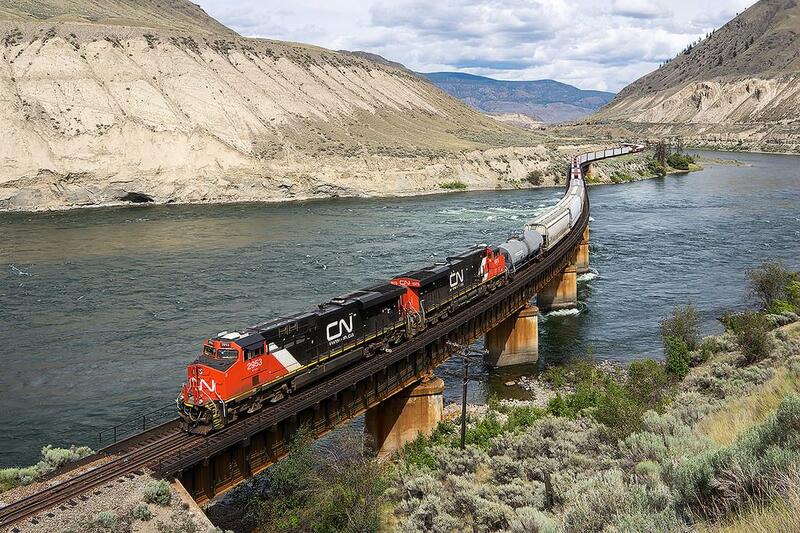 A combination of several factors together has provided CN with the sustainable competitive advantage. The already-wide economic moat is even being strengthening, thanks to the investments in technology and innovation. The growth prospect is moderate, and the risks are modest, as examined. Clearly, the management has the generosity of returning capitals to shareholders. Canadian National Railway (or CN) (NYSE:CNI) is Canada's largest railway, in terms of both revenue and the physical size of its rail network. The company has the only transcontinental rail network in Canada, spanning from the Atlantic coast in Nova Scotia to the Pacific coast in British Columbia, as well as the only transcontinental network in North America, connecting to three coasts: Atlantic, Pacific, and the Gulf of Mexico. It is the namesake of Toronto's CN Tower and a favorite investment of Warren Buffett's long-time friend Bill Gates. 2019 just marks CN's 100th anniversary. The stock is listed on both the Toronto Stock Exchange (under the ticker CNR) and the New York Stock Exchange (under the ticker CNI). The railroad industry in North America is highly concentrated: the 50 largest companies hold nearly 100 percent of the market. The major players in the industry should have been enjoying less competition from the high barrier of entry due to the restriction for new railway infrastructure to be built in the region as well as some favorable environmental policies expected to tilt towards goods transportation through railways. 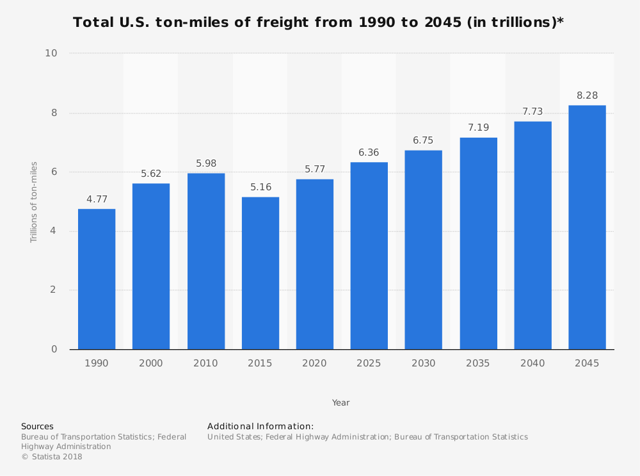 According to the Association of American Railroads, moving freights by rail instead of heavy truck reduces greenhouse gas emission by 75%. 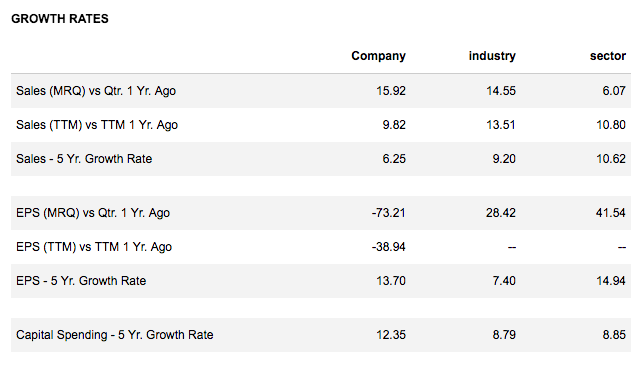 Ranked by my factor-based model, the industry factor for CNI beats 69% of my investable universe. One of the most solid moats for a business is something that is hard to replicate or replace. 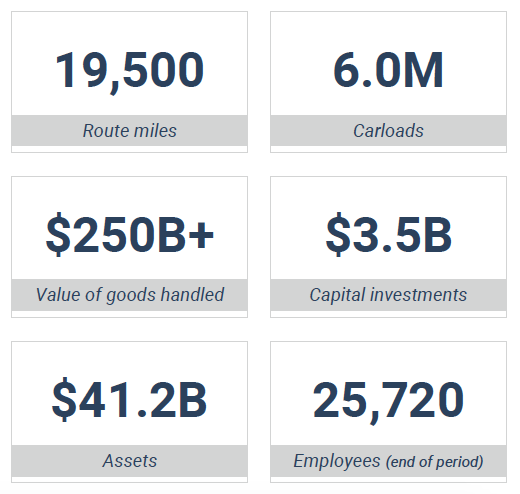 Canadian National Railway constitutes the backbone of the North American economy, with its scale and unique assets (see major metrics below). One benefit from economies of scale is that the company can easily spread out its operating expenditure and capital expenditure (e.g., the investments in advanced technologies). 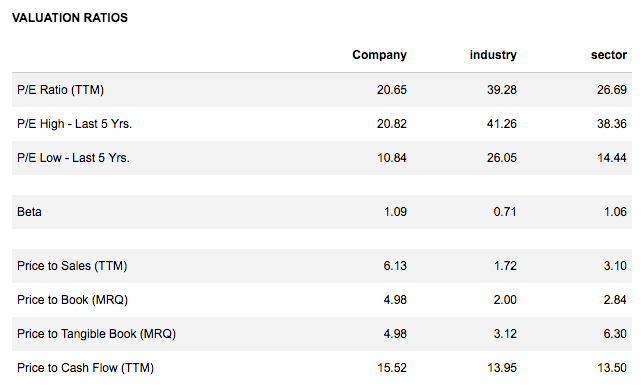 CN is the second largest Canadian non-bank company by market capitalization. As previously indicated, the uniqueness of CN's assets lies in its rail network that connects three coasts, which provides more comprehensive, efficient and cost-effective transportations across the continent compared to its peers. According to the company, over 65% of traffic originates and terminates on CN's network. 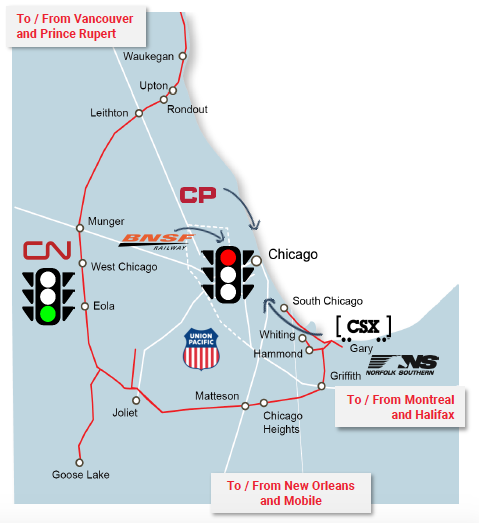 Through the acquisition of Elgin, Joliet and Eastern Railway in 2009, CN now possessed the fastest route in and around Chicago, one of North America's busiest freight hubs (over 25% of US rail traffic touches Chicago at some point), providing service advantages. Source: CN Investor Presentation, March 2018. Additionally, Canadian National Railway enjoys exclusive access to Prince Rupert, North America's closest deep-sea port to Asia, as well as the lowest rail grades among all West Coast railroads across the Rockies, giving CN a natural cost advantage to and from the center of the continent. 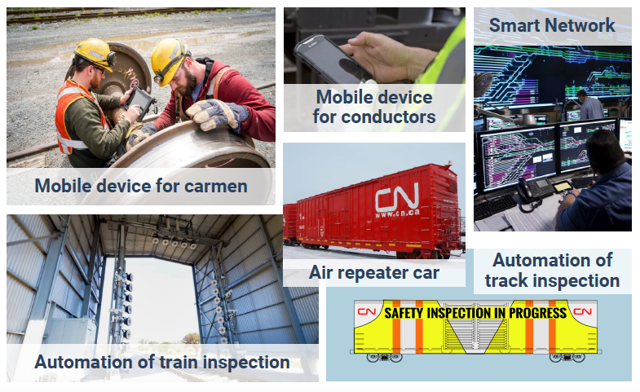 The management at CN put plenty of emphasis on technology and innovation (see some of the examples below). For example, Track Evaluation System (or TEST) cars utilize multiple technologies to automate engineering track inspections; mobile applications are developed for car mechanics to streamline reporting; the first ARIP (Automatic Railcar Inspection Portal) was installed in Winnipeg (and 7 more to roll out this year) to improve asset reliability and availability. Those investments help CN to stay competitive and widen the moats through continuous improvements in operational safety, efficiency, productivity. As seen below, CN has been driving accident rate and carbon emission down for the past few years. Moreover, the company now claims to be even 15% more fuel efficient than the rail industry average. 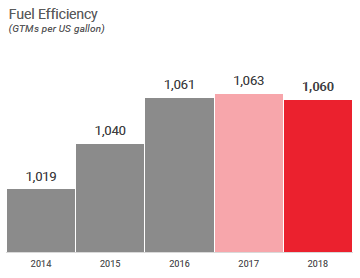 The combination of pricing power, thanks to less competition in the industry, operational efficiencies, unique scale, and structural network advantage, has provided CN with the sustainable competitive advantage to achieve one of the best operating ratios year after year (see below). Ranked by my factor-based model, CNI beats 83% of my investable universe in terms of profitability. With a wide economic moat in place, there is no wonder why the company has consistently generated superior returns on capital for the past decade (see below). Although CapEx ratio is relatively high (especially compared to other industries), the management has employed a disciplined investment approach that supports operations in the short term for safety and productivity enhancements and is measured strictly by ROIC for the long run. As a result, free cash flow margin (see below) has been well above the 10% mark for the last few years. Within the railroad industry, CN has been outperforming its peers on average in terms of returns on capital and margins at all levels (see below). CN has a below-industry-average balance sheet on both the liquidity side as well as the long-term debt side (see below). Both the current ratio and the quick ratio have been improved modestly over the past couple of years, while the debt-to-equity ratio is hitting a 10-year high. Ranked by my factor-based model, CNI beats only 24% of my investable universe in terms of capital efficiency, financial strength, and cash flow. This is mainly due to the capital-intensive nature and high debt level of the railroad industry. 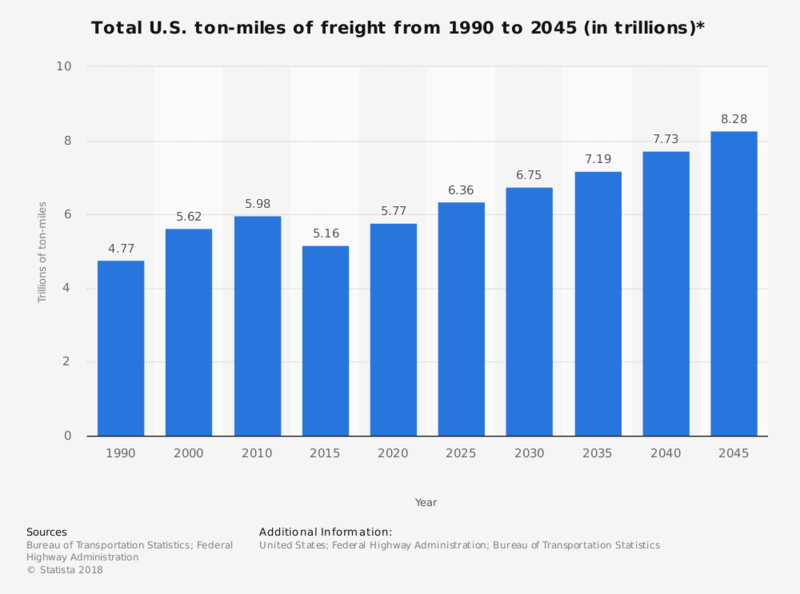 According to Statista below, total US ton-miles of freight is expected to grow 45% by 2045. 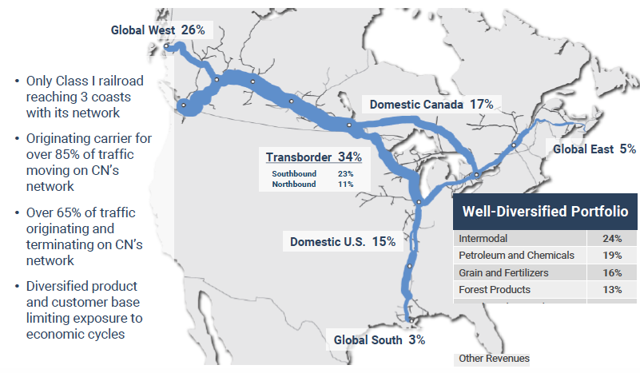 Within the railroad segment and for CN, in particular, the company states that intermodal remains a key growth driver, with increasing volumes resulting from its unrivaled access to the 3 coasts through 14 different port terminals. 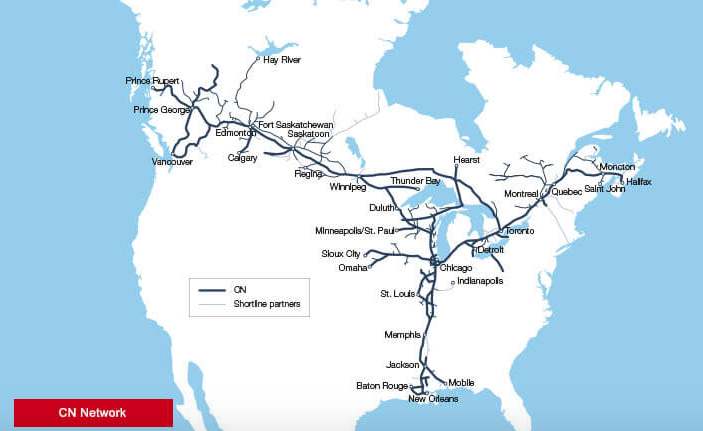 Adding to this unique network span are CN's exclusive accesses to outer-belt around Chicago's highly congested downtown area (total freight volumes are expected to rise by 45% at the Chicago region through 2040) as well as Prince Rupert, North America's fastest growing deep-sea port, to capture opportunities to increase natural resources exports. 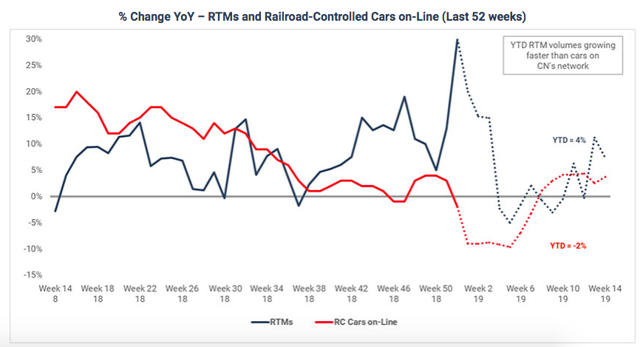 According to the CN website, the business delivered decent YoY growths in RTM recently, mainly ranging from 0% to 15% over the last 52 weeks (see below). For the past 5 years, CN underperformed the industry in terms of revenue growth, while overspending on CapEx (see below) - a warning signal that investors should keep an eye on. However, EPS at CN did outperform. In 2019, the management estimated a high-single-digit RTM increase, with pricing beating inflation (as usual), as well as a low-double-digit growth in adjusted EPS. 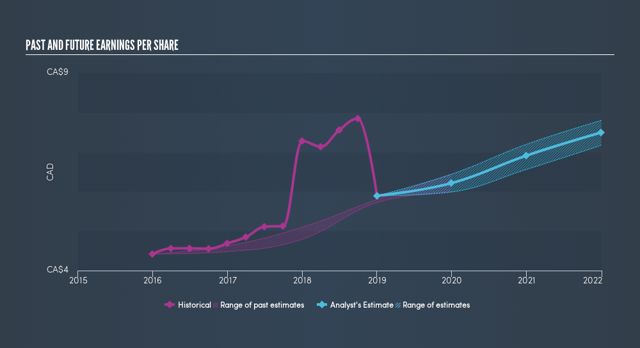 According to SimplyWallStreet, earnings at CN over the next 3 years are expected to increase at 5.6% annually (see below), which, if realized, may lead to a lower dividend growth rate. In terms of growth and momentum, CNI beats 93% of my total investable universe. 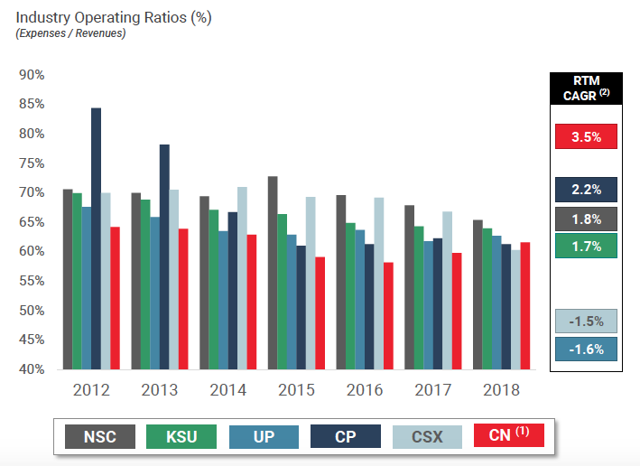 CN has reduced its outstanding shares from 947 million in 2009 to 738 million in 2018 - a decrease of 22% (or 209 million) in a decade. Last year, over 80% of the adjusted net income was returned to owners through share buyback and dividends. Just in January, the management also decided to raise the company's cash distribution to shareholders by 18%, which represents CN's 24th consecutive dividend increase (actually, every year since its 1995 IPO), as well as approved a new share repurchase program of up to 22 million shares. The CAGR of all historical annual dividends is an astonishing 16%, significantly beating inflation almost anywhere and industry average (see below), and the management set the target of payout ratio at 35%, a level for plenty of security. It is clear that CN has the generosity of returning capitals to shareholders. 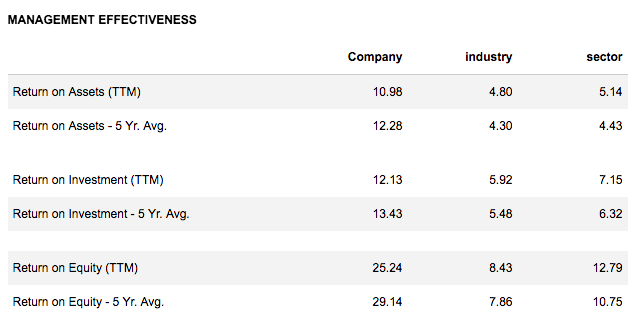 Ranked by my factor-based model, the stock beats 74% of my investable universe in terms of shareholder-friendliness. The current valuation of CNI appears to be roughly in line with its 5-year historical average level, in terms of price multiples (e.g., P/E, P/S) as well as dividend yield. If looking at a wider time horizon spanning the previous 10 years, we see lifted relative valuations from 2013 through 2018 compared to pre-2013. 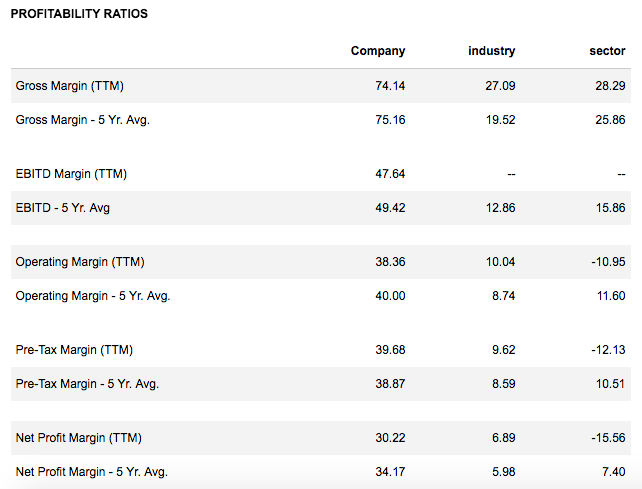 If benchmarked against the industry average, Reuters' data (see below) implied a picture of overvaluation (regarding P/S, P/TB, P/CF) of CNI's share at the current level. Although the valuation risk seems to pile up for the last couple of years, please also be aware of the outperformance of CN's EPS, as previously indicated, as well as the superior returns on capital protected by a widening economic moat. So far, we went through the durable competitive advantage for CN to generate sustainable and superior cash returns on investments for its owners as well as the price tag, indicating a little overvaluation of the stock. However, before making any investment decision, investors need to understand the risk involved and weigh it against the potential reward. Management changes always create uncertainties, which then lead to risks for investors. Early last year, the then President and CEO Luc Jobin unexpectedly stepped down. CN gave no specific reason why Jobin stepped down after only about two years in the position, saying only that its Board "believes the company needs a leader who will energize the team, realize CN's corporate vision and take the company forward with the speed and determination CN is known for." Therefore, it is fair to believe that the move is performance-related. Jean-Jacques Ruest was appointed President and Chief Executive Officer in July 2018, after having served as Interim President and CEO since March 2018. He has been with the company for twenty-two years, the last eight as Executive Vice-President and Chief Marketing Officer. In light of such a lengthy tenure of Mr. Ruest with the business, the risk arising from the recent management change is contained. Over the course of his career, Mr. Ruest has been honored many times by the business community, notably as 2019 Railroader of the Year and an Inductee to the International Maritime Hall of Fame in 2017. 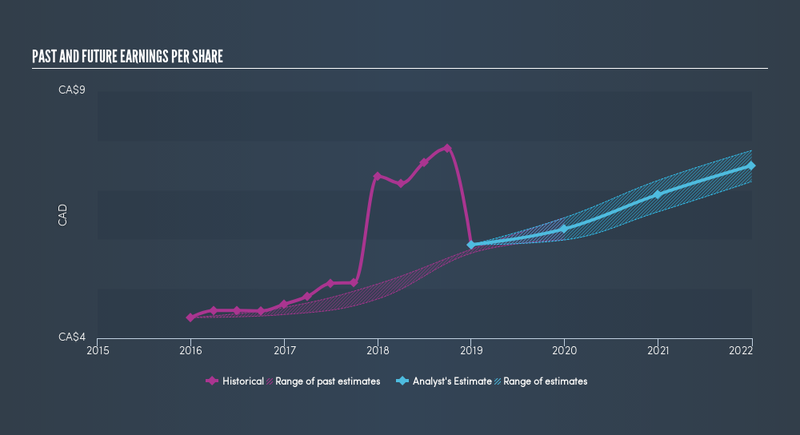 I think that most of the uncertainties with regards to the new CEO in place have diminished or already priced into the stock for the past year or so. 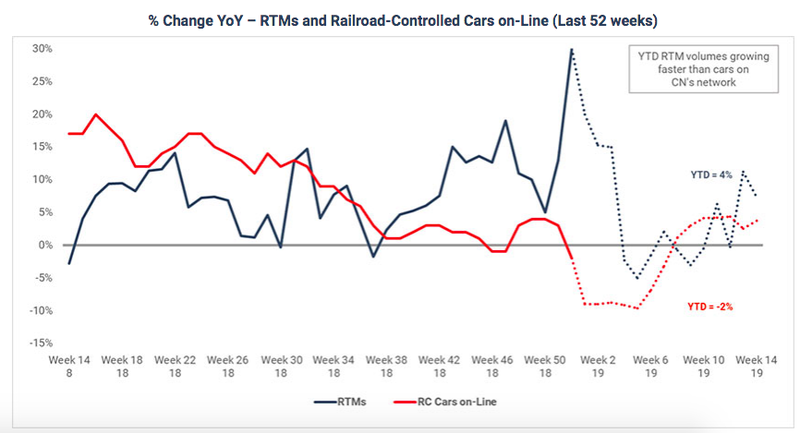 The economic cycle is the risk that all railroads have to confront, as pricing and demand for the commodity and other products to be transported directly affect the revenue of railway companies. When it comes to CN's business, fortunately, the diversified product and customer base (as demonstrated below) should help limit the company's exposure to economic cycles. One last risk worth mentioning although being relatively mild is the net insider selling over the 12 months, in terms of both volumes and transaction (see below). Source: SimplyWallSt; data as of 4/10/2019. 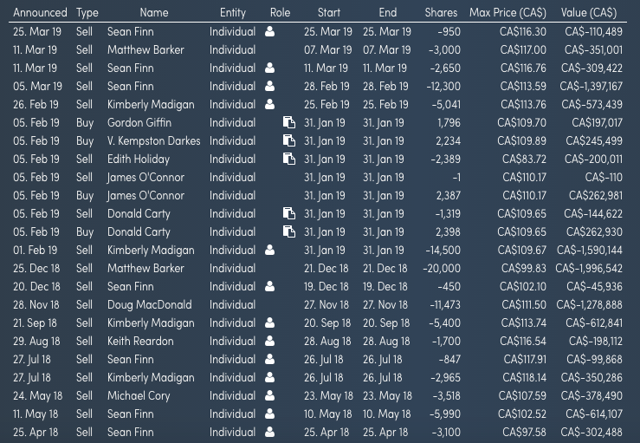 As SimplyWallStreet suggested below, members from both the management team and the board have sold shares, while only members from the board have bought shares during the period. 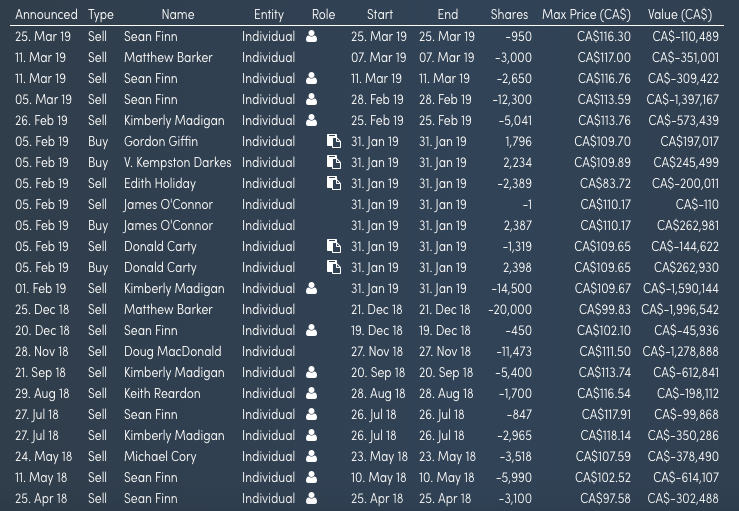 Insider selling is not necessarily associated with fundamental deterioration of the business and could be related to more personal situations in many cases. But investors should be aware of and keep an eye on this development. Historically, it is easy to find near-monopoly players in the railroad industry. 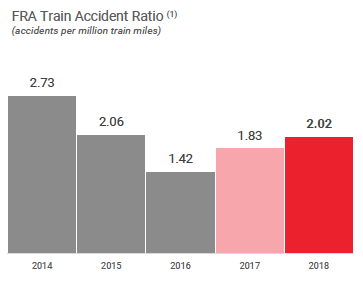 Leveraging the unique structural network advantages along with its culture of technology innovation, Canadian National Railway should possess an already-wide and strengthening moat to protect its economic castle. In light of this sustainable competitive advantage, moderate growth prospect, decent profitability, shareholder-friendliness, I would like to give CNI a buy rating at this pricing level for long-term buy-and-hold investors, even assuming very modest risks in terms of balance sheet, insider selling, and valuation. Lastly, concerned about the dividend withholding tax on Canadian stocks? US-based investors can avoid such taxation by buying the Canadian stock in their IRA accounts. Disclosure: I am/we are long CNI. I wrote this article myself, and it expresses my own opinions. I am not receiving compensation for it (other than from Seeking Alpha). I have no business relationship with any company whose stock is mentioned in this article.